The parties share a desire to reach a speedy result and are willing to compromise. The issues can be narrowed by sharing information. There is not an imbalance of power between the parties (such as would occur in a domestic abuse situation). The parties need an outside, reasonable voice to bring them to center. The parties understand that mediation is not a win/lose situation. Everyone wins something and everyone loses something. If you think your circumstances are appropriate for mediation, please contact our office for a free consultation. 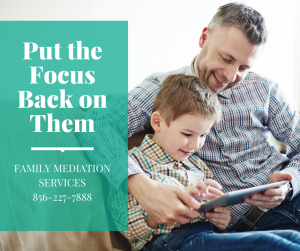 Unlike some mediators, we will attempt to resolve your matter in a couple of sessions and direct you to the next steps in finalizing your matter. Ethics, integrity and fairness are our hallmarks. Call 856-227-7888 for a free consultation to discuss mediation services.